I suppose at its heart, in the very middle of a circle which circles itself many times over, is the question of Emery Staines. Is this owner of gold-bearing ground in New Zealand alive? Did he, in fact, leave two thousand pounds to the whore Anna Wetherell? But the route to this question is so circuitous, so intricate, so multi-layered and nefarious that it took me to page 550 to even determine a core question. 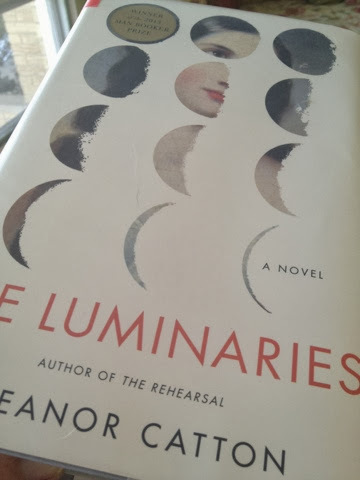 I am amazed at the skill with which Eleanor Catton has woven The Luminaries, a novel which even up to page 746 (of 830) has me guessing at supposed motives and the outcome of events. Is it a mystery? Yes. Is it a finely crafted novel exquisitely written? Yes. Is it any surprise that it won the 2013 Man Booker Prize? No. Is this an enticing review? (Was that a rhetorical question?) The quotations are thought-provoking. I have this. Now to find time to read it! 830 pages? But not a challenge of a lifetime. It can be done. Good suggestion. I have been looking at this one. Haven't committed yet but it does look interesting. I love the quote. I've been curious about this book but it's just too thick an obstacle. Thanks for your review. At least I know it's a worthy read. I'm sure… a potential movie? Thanks for posting, Bellezza. I got the book for $2 from the bookshelves of the Friends of the Library at the entrance of the county library where every book is $2. Today January 27 and first page of The Luminaries showed the story started on January 27. Of course the year was 1866. I have to put aside Doris Lessings's the Golden Notebook. I'm so happy for you to find it for $2.00! My edition was from the library because I've got to stop buying books. Soon! Anyway, I could never get into The Golden Notebook, even though it's so famous, but the Luminaries is mesmerizing. Let's talk when you're done. I feel I could read a second time even though I finished it yesterday. I am dying to read this one — I have an e-ARC that will likely expire before I can get to it! Those are great quotes. Okay I think this is definitely going on my TBR list. And, my friend, you will need a lot of time if you read like I do: carefully. Not only is the page count high, but keeping track of the characters and their motives/actions is a bit…complicated? Multi-layered for sure. But, I found it very worth every minute. I will be thinking about it for a long time, and probably will reread it again this year. Isn't that a great quote? Especially for someone in her twenties! I can't imagine how it would work as a movie…you probably could, though. It's so complicated it would take a master director to get every little detail correct. I'm not even sure how the author did it! It is a worthy read, though, as so well executed it almost comes off as a movie in one's mind. I really think you should read it, Iliana. It would also be a great book to have has a read along, or book club, because there's so much to discuss. Ponder. Wonder about. As is each character's motivation. I'm really glad to know you found this one to be worthwhile. I've been itching to buy it, but I haven't taken the plunge yet. Even though my edition was from the library, I'm seriously considering buying a copy of my own. The more I think about it, after reading it, the more entranced I am. I think it would be a worthy addition to (y)our library, Andi. Which is usually what I find to be the case with Man Booker awards.